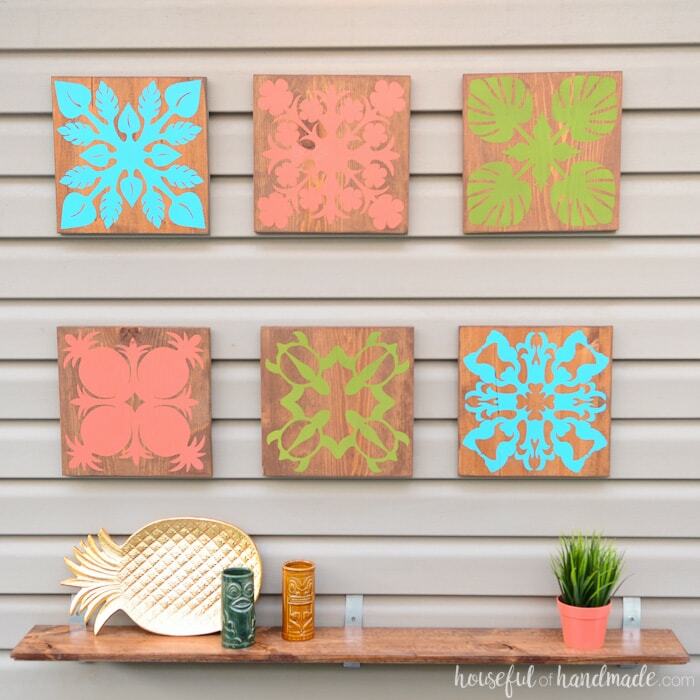 Create beautiful tropical wall art in just a few easy steps to turn your home or patio into a tropical oasis. This tropical art is inspired by Hawaiian quilting techniques. 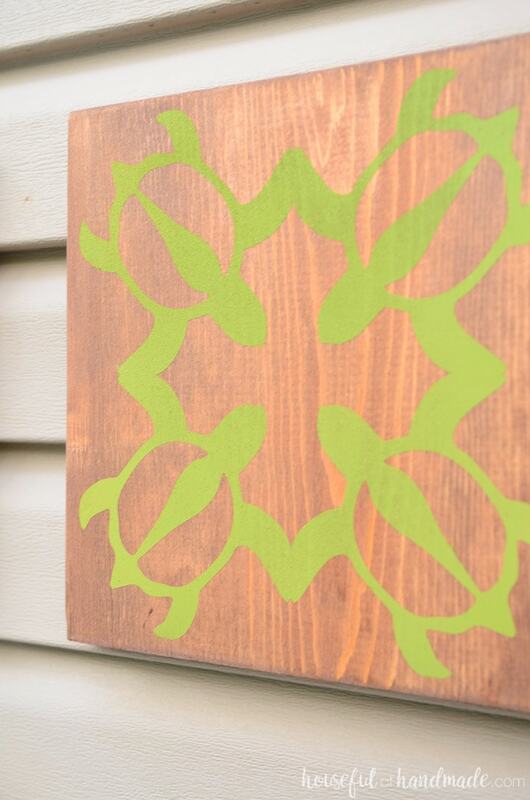 Turn a 6′ 1×10 board into tropical wall art that will take to you the islands. This easy wall art is the perfect way to add a tropical vibe to any room. 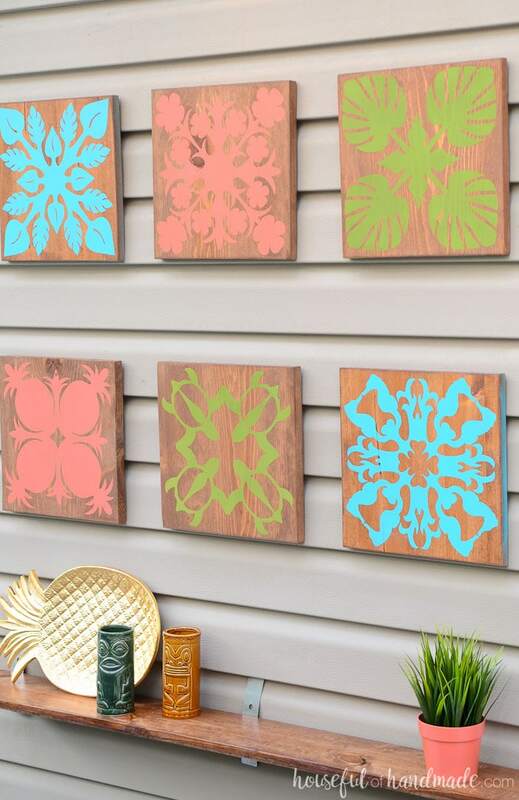 Bright, bold colors on a warm wood background are the perfect way to create a tropical feel to any space. And the Hawaiian quilt block designs add in all your favorite tropical elements. I know I should be posting all things fall, but when you are transforming your unused side yard into a tropical oasis the last thing you need are pumpkins. I have enough real fall leaves to remind me we are not sitting on the lanai enjoying our dinner. So it was time to add more tropical elements to our patio pergola area to help us think of the ocean instead. The first time I visited Hawaii, we visited most of the Hawaiian fabric and quilt stores on Kona. My mother, sister and I spent hours perusing the beautiful island batiks, tropical quilts, and my favorite: traditional Hawaiian quilts. The Hawaiian quilts are created like you would create paper snowflakes as a child. You fold a paper into 8ths and draw a tropical themed design. Then when you unfold it, you have a kaleidoscope of island fun! My favorite Hawaiian quilts blocks had seahorses, pineapples, turtles, and big bold leaves. These are all the things that mean the islands to me. 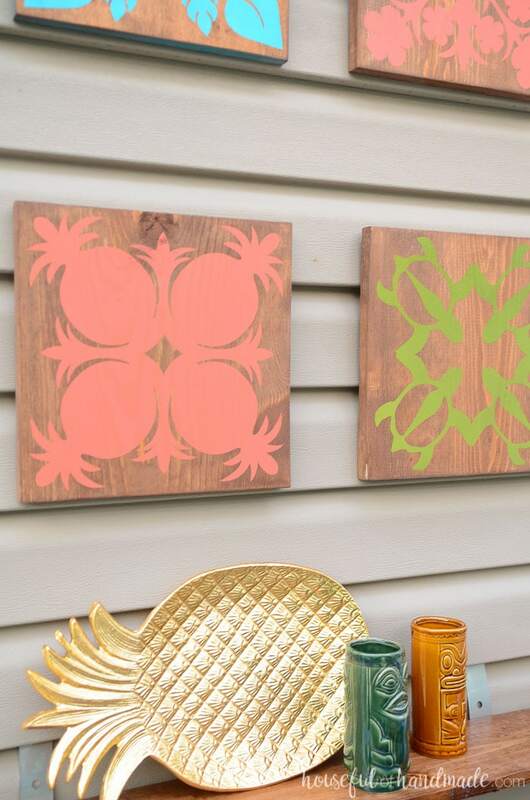 Since I know I will probably never get around to making my own Hawaiian quilt (even though I bought a book to teach me how), I decided to use them for inspiration in creating the perfect tropical wall art for our patio oasis. When decorating indoors, I always think about how to decorate the walls. But when I decorate outside, it is usually the last thing I think of. Well, not this time! 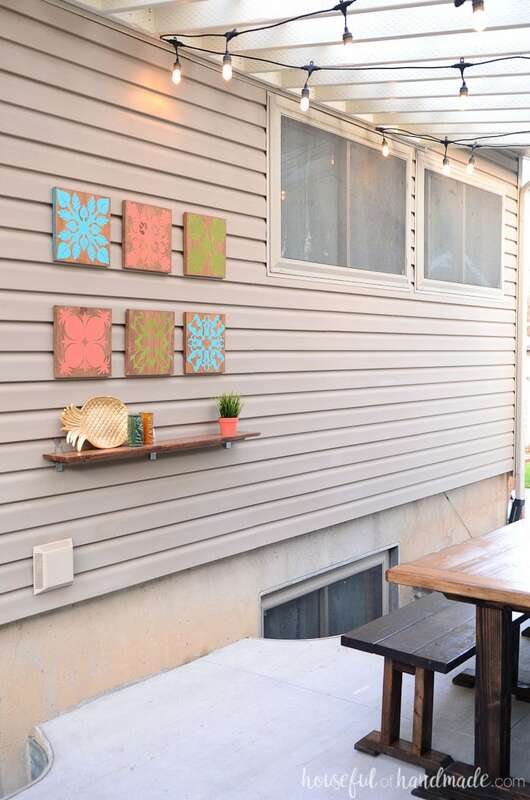 I was pretty proud of myself for thinking about the large wall of vinyl siding in our patio area. I knew I needed to do something with it to help make the space part of the outdoor kitchen and dining area instead of just the outside wall of our home. And instead of 1 large picture, I decided to go for 6 of my Hawaiian quilt blocks to fill up the space. 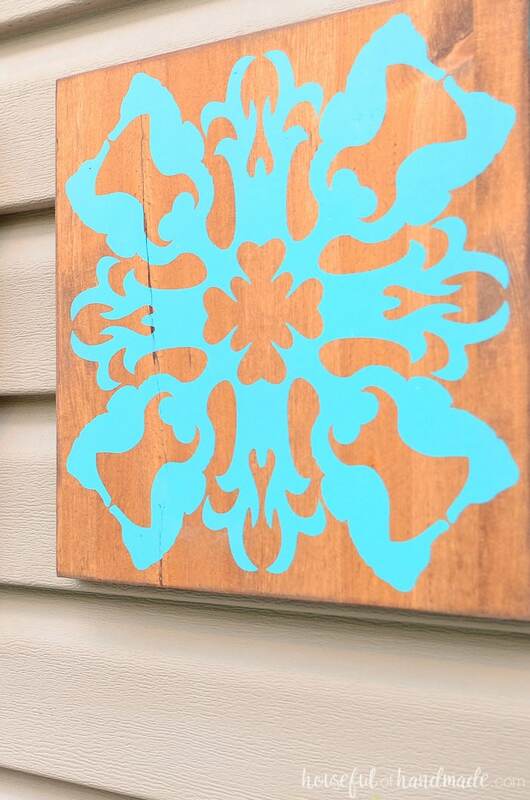 And I absolutely love how the tropical wall art turned out! I am excited to share this super easy DIY with you, just click on the arrow below for the complete tutorial. These are cool projects! Wall arts play an important role in interior design. These are great way to add some flair to your room and really put your own personal touch on it. Wall arts fill a house with positive energy. I am totally inspired with your work. Thanks for sharing this. It didn’t take me long to figure out that the patterns were actually of island animals repeated. So cool to learn that they use the snowflake trick to make them! I love what you did. Now… do you have a post about your Hawaii trip? I am in the midst of trying to plan one.